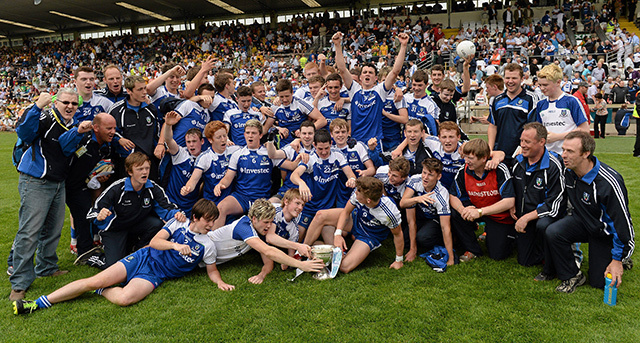 On the same day their seniors ended a 25-year wait for the Ulster title, the Monaghan minors ended a 68-year wait for the minor crown with a dramatic victory over Tyrone in Clones. Tyrone led 2-14 to 2-7 with around 12 minutes remaining, but Monaghan hit two goals before the end to grab a thrilling victory. Barry McGinn’s second goal of the game made it 2-14 to 3-7 to give Monaghan hope, and two points from Conor McCarthy shortly after the goal left just two points between the sides heading into the closing stages. Tyrone had Ruairí McGlone sent off after he picked up a second yellow card towards the end of the game, and the Red Hand goal came under severe pressure in injury-time as Monaghan pressed for the goal which would have put them into the lead. They were dramatically awarded a penalty with time almost up, and Fearghal McMahon made himself a hero as he tucked away the kick to put his side into the lead. When that score was followed seconds later by a Monaghan point from Donál Meegan, the game was won and Monaghan were the champions. McMahon had goaled in the first half to make it 1-1 to 0-7 after a blistering Tyrone start, and then McGinn’s first goal of the game just shy of the break made it 2-1 to 0-9. However, Tyrone twice found the net either side of the break through Conor McKenna and McGlone to lead by six points early in the second half. Monaghan were extremely determined though, and they eventually took the win courtesy of their two late goals.